Are you looking for ways to improve your jumping position and performance? 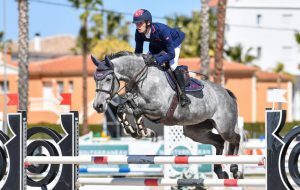 If you’re a jumping enthusiast, then you will no doubt know the importance of selecting the right stirrups for the job! 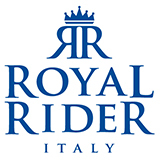 Since 1998, Royal Rider’s commitment has been to design unique, elegant, technical and technological stirrups that out-perform their competition, in all riding disciplines. We were the first to introduce technical materials used in the automotive and motorcycle sectors to design brackets that could support the athletic movements of the rider, over jumps, in flatwork, in gallop, and also in endurance and polo. Our stirrups encapsulate passion, joy, emotion and beauty. Can your stirrups enhance your riding performance? But can your stirrups actually enhance your riding performance? We believe the answer is, yes. A highly engineered stirrup like those made by Royal Rider helps aid rider balance; when jumping, it helps the rider keep their stirrup iron on the approach, take off, jump, landing and get-away; and of course, cleverly-designed stirrups such as the RR T3 (pictured far below), combine ergonomics and resistance, allowing the rider to maintain the correct position of their foot, and achieve greater balance over a fence. AIDING BALANCE; OFFERING SHOCK ABSORPTION; PROMOTING A GOOD RIDING POSITION; ALLOWING SAFE RELEASE. If you’re a rider that needs to hone their jumping position, would you like some tips to help get the best from your jumping rounds? The first thing to remember is that the correct jumping position should be comfortable for both you and your horse. You need to go with the motion of your horse over a fence, and not be ahead or behind in the movement. Ahead of the movement would interfere with his action, distract him and would often result in you being thrown backwards in the saddle. Behind the movement, and you are likely not to give with your hands, resulting in his head being jerked up, producing a poor jump or cat-leap that prevents him travelling forwards over his fence. Your stirrups need to be short enough so that you can comfortably get your seat out of the saddle, allowing your horse to bascule (create an arc) through your legs. Your heels must stay down, and you need to have a bend in the knee, keeping your lower leg position the same and not allowing it to drift backwards. You should lean forwards, look ahead to where you are going, and move your hands a little up the horse’s neck to allow him freedom. He will be unable to jump correctly if you hinder him by not giving enough with your hands, or get out of balance with him over a fence. When your jump is complete, you need to be able to get back into the normal riding position easily – the right stirrups definitely aid this! A good exercise to allow you to keep your position for longer whilst jumping and therefore perfect it, is to set up a series of small bounce fences, where the horse will not put in any strides between each jump; you must maintain your jumping position throughout the grid. Longer and more complex gridwork is very useful too – set up a line of fences which can be a mixture of bounces, one stride and two stride distances between each jump. (Always place your bounce fences, if you are using them, at the beginning of a grid. A double is two fences with one or two non jumping strides between them. One non-jumping stride is approx 7.5m, and two non-jumping strides approx 10.7m, but this is totally variable depending on the horse in question). With this exercise, if you are not regaining your flatwork position quickly enough on landing, it will become obvious, as you will lose balance and struggle to get the next fence right; you should try to sit up a little earlier. 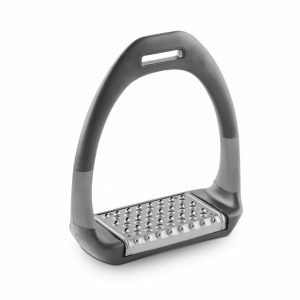 Check your stirrup length – and consider a model such as the RR T3 (pictured left) one of a range of highly-engineered stirrups which allows the rider to achieve greater balance over a fence, and keep the stirrup. If you feel your stirrups are hindering not helping your jumping performance, do check out our range. Royal Rider Stirrups stirrups encapsulate passion, joy, emotion and beauty. Our passion blends with the expertise of those who for over 20 years, have designed product trends that unite horse and rider. 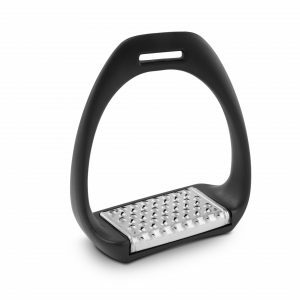 NextChoosing the perfect stirrup for your horse riding discipline – whether pleasure riding, eventing, showjumping, hacking or dressage!